Inventory in the Coachella Valley rose to 5,116 units on March 1, the highest level since May 2011. The median price per square foot in the Coachella Valley dropped $1 in February to $179 — a gain since last February of only 3.5 percent that punctuates the rapid deceleration of the double-digit gains of the last three years. Only four local cities — Coachella (30.4 percent), Indian Wells (28.8 percent), Palm Springs (14.9 percent), and Desert Hot Springs (10 percent) — posted year-over-year double-digit home price increases. In two cities — Indio and La Quinta — prices declined from the previous year. Inventory is rising with the prices, affecting affordability and ultimately sales. Tight (and unnecessary) lending standards of the banks also affect sales, although Fannie Mae and Freddie Mac have been working hard to counteract and change this. They have clarified for the banks the situations that could cause loan “put backs,” returning bad loans for which they felt the bank was responsible. They also created loan programs with low down payments to assist new home buyers who have been too hard-pressed financially to participate in the market. We’re uncertain if these efforts will loosen banks’ lending standards; it’s essentially a race against changing conditions. Months of sales — the number of months it would take to sell off the entire inventory at the current sales rate — rose to 7.3 in the Coachella Valley in February, which means more home buyers must qualify for loans to keep supply from eclipsing demand and forcing home prices down. 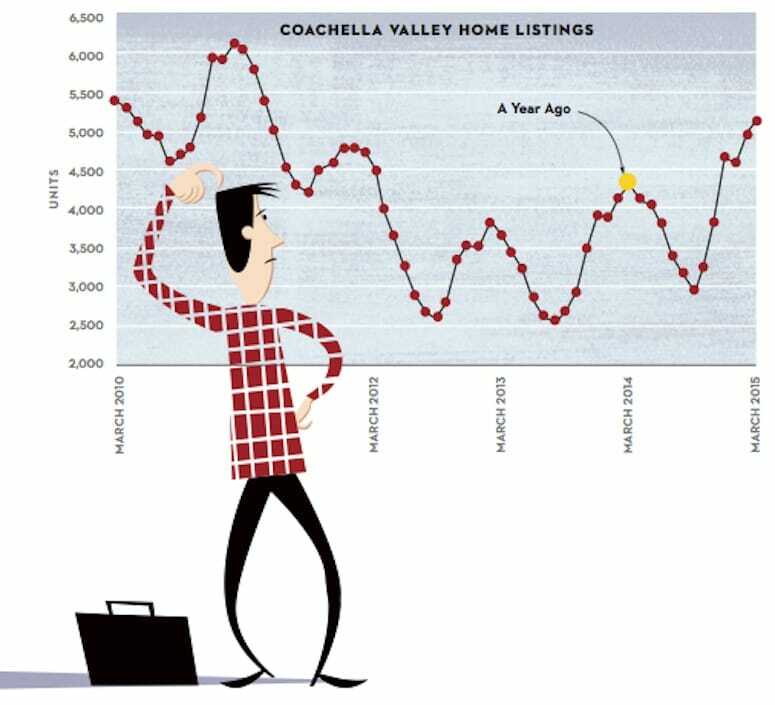 Average “days on the market,” which measures the time it takes to sell the average home in the Coachella Valley, is currently 97 days but rising. Inventory rose to 5,116 units on March 1, the highest level since May 2011. Some of this is seasonal, but mostly represents a natural rise in the number of homes for sale due to high prices. People withheld selling during the low-price period of the housing crisis, and some of these homeowners — as well as early investors who have large price gains — are now coming to the market. We expect inventory to now decline as we go into the buying season. A better way to measure the effects of rising inventory is to divide it by the current months of sales. Currently, the months of sales figure is 7.3 months — the highest ratio since April 2011. It is also above six months, the number often considered the dividing line between a buyer and a seller’s market. We expect this ratio to decline as we head into the active housing season. Average “days on the market,” which measures the time it takes to sell the average home, is currently 97 days but rising. It generally lags “months of sales.” With rising months of sales, we expect days on the market to surpass 100 days relatively soon.